Position a rack in the center of the oven and heat the oven to 375̊F. Arrange a flat roasting rack over a heavy-duty rimmed baking sheet. Heat 2 T of the oil in a 10-inch skillet over medium-high heat. Add the garlic and rosemary and cook, stirring, until fragrant but not browned, about 20 seconds. Add the scallions, season with salt and pepper, and cook, stirring occasionally, until softened, 1 to 2 minutes. Add the mint and parsley and cook, stirring, for another few seconds. Remove from the heat and transfer to a medium bowl. Pat the lamb loins dry and season with salt and pepper. Heat the remaining 1 T oil in a 12-inch skillet over medium-high heat until shimmering hot. Cook the lamb, turning once, until two sides are nicely browned, about 2 minutes per side. (Since the loins are so small, sear only the top and bottom; you don’t need to bother with the sides.) Transfer the lamb loins to the roasting rack on the baking sheet and let them cool for a couple of minutes. Stir the panko, mustard, and honey into the scallion mixture and season to taste with salt and pepper. Divide the panko coating between the two loins, gently pressing it on so that it covers the top and comes partway down the sides. Roast the lamb until an instant-read thermometer inserted in the thickest part of a loin registers 125̊F for medium rare, 15 minutes. 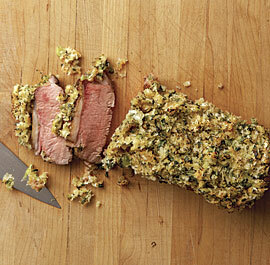 Transfer the lamb to a cutting board and let it rest for 10 minutes. Slice the lamb ½-inch thick and serve; make sure to scoop up any crust that falls off the lamb and scatter it over each serving. This entry was posted in Main Courses, Recipes from Adrienne's pantry and tagged dijon, garlic, herbs, lamb, lamb loin, lamb tenderloin, mint, mustard, panko, parsley, rosemary, scallions. Bookmark the permalink.